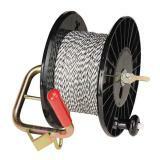 An effective reel for winding, unwinding and storing conductors. 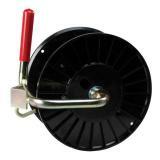 The SupaReel is the strongest fence reel in the US. The only reel rugged enough to carry heavy conductors like steel MaxiShock™ Wire and soft steel wire year in and year out without breaking when they're dropped (as reels often are in field usage). 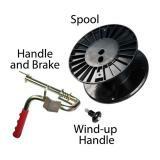 Pre-Wind Option—If you would like one of our conductors pre-wound on a SupaReel, see accessories tab below. 5.25" wide x 10.5" tall. The circumference of the reel on which the conductor is wound is 17". You can hang the SupaReel by using brackets (sold separately). You may purchase extra spools and interchange w/the wind-up handle and carry handle and brake (each sold separately above). 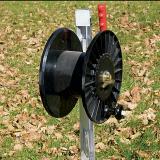 Can also hang the SupaReel on either wood or steel post by using a wood bracket or a T Post bracket (sold separately). 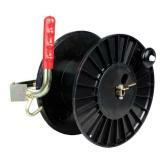 Also available is our SupaReel 3-Reel Post. Holds up to 3 SupaReels. Convenient end post for multi-strand fences. Spade on the bottom for stability in soft soils. Pre-Wind Option—If you would like one of our conductors pre-wound on a SupaReel, see accessories tab above. Had trouble setting the lock and the hook was a struggle to get it attached to the permanent fence. The hook needs to be opened up. More. I assume with usage the lock will be easier to lock and unlock. Works good, the annoying part is that if you want to use it on a T post you have to get a separate bracket for it, (which they don't mention here). SupaReel T Post Bracket Item #238500 the other bracket DOESN'T work with this! Tthis is the first time I've used polywire and a reel for a temporary fence and I really like the Supra reel. It's well made and simple to use. 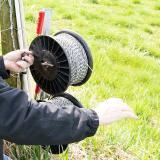 WE have to protect our wheel lines from damage by "rubbing cows" these reels allow us to put up and take down the temporary fences very quickly. 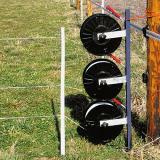 When combined with the 20B energizer, we have a great system for temprorary fencing. I have half a dozen of these and have used them for several years. I think that they are about the best reel on the market but they could be improved. First, the rubber handles are too flimsy and slip off constantly while you're reeling up conductor. Second, the bottom of the U on the bracket is too narrow, so when the reel fills up the knuckles of the hand holding the bracket and trying to keep the handle from slipping off are constantly being scraped by the conductor. Have a couple dozen of these. The newer ones with the flip stop and spring are much better than the screw down tight onto a rubber gasket type ones. Durable as far as portable goes... especially the handle & brake. The hood needs to be bent up a bit if you are going to hang it off of another wire fence otherwise you will fight it for the next 10 years because that is how long you will have them if you keep your fence hot. Only dislike is not making it free freight. I just bought 3 and it cost more than $25 to ship them and pre winding now cost $3 when it used to be free. I just spent over $400 and you can't throw me a bone once in a while?